In the fall of 2015, Twin Cities Public Television (TPT) finished a $20M project to completely renovate their offices in downtown St. Paul. Prior to the renovation, TPT’s lobby was located next to a skyway entrance on the second floor. Since 1989, there had been plans to move the lobby down to the street level to make the organization more accessible to the public. Thanks to a successful capital fundraising campaign, these plans are now finally realized. The lobby is now part of a street level performance space that can hold up to 200 people. Videos are shown using a Sony 7000-lumens laser projector and a 108”x192” Da-Lite projector screen along with four Sharp 60” displays. Audio systems include Electrovoice speakers, Audio Technica wireless microphones, and a Biamp TesiraFORTE digital signal processor. The audio systems have the capability to support both presentations and musical performances. 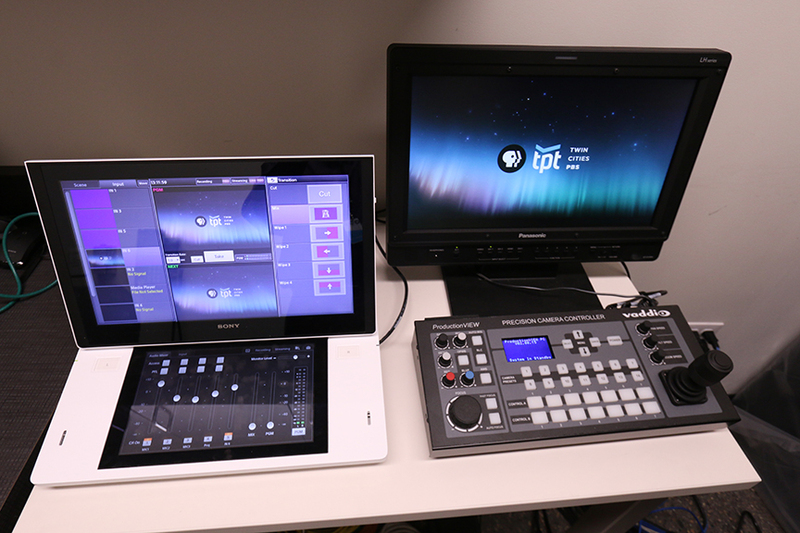 Alpha Video designed a small broadcast control room with a Sony Anycast switcher and installed three Vaddio Roboshot HD cameras so that performances can be broadcast. The key to the success management of this space is a Crestron Digital Media Control system programmed by Alpha Video. The Crestron systems allows one person to control all of the audio and video systems using a touch screen monitor. We moved into our current location in 1989 when private offices were all the rage. As a result, there were lots of corridors that made it hard to find people and to collaborate. We had a number of objectives for the office renovation, but the two most important were radically upgrading the meeting spaces in the office area and adding a new lobby and performance space at the street level. We partnered with Alpha Video to integrate the audio and video systems to reach both of these objectives. 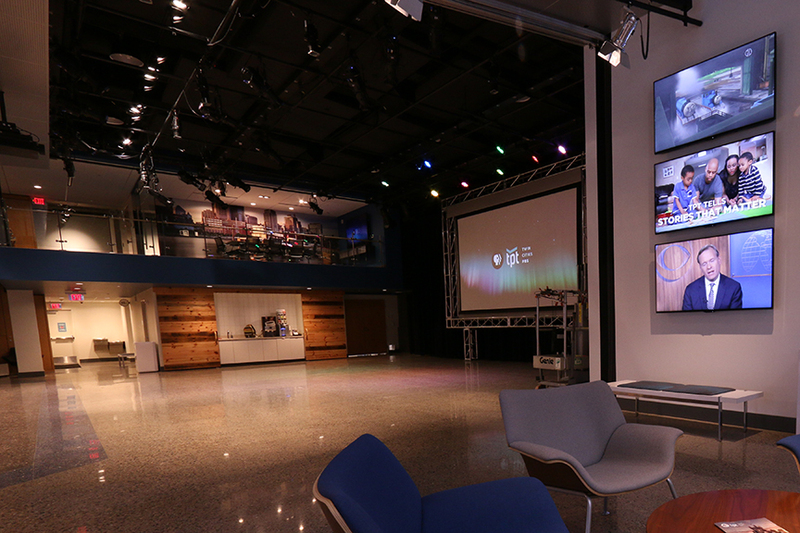 The old TPT lobby is now the Studio Atrium where TPT can show its digital content. 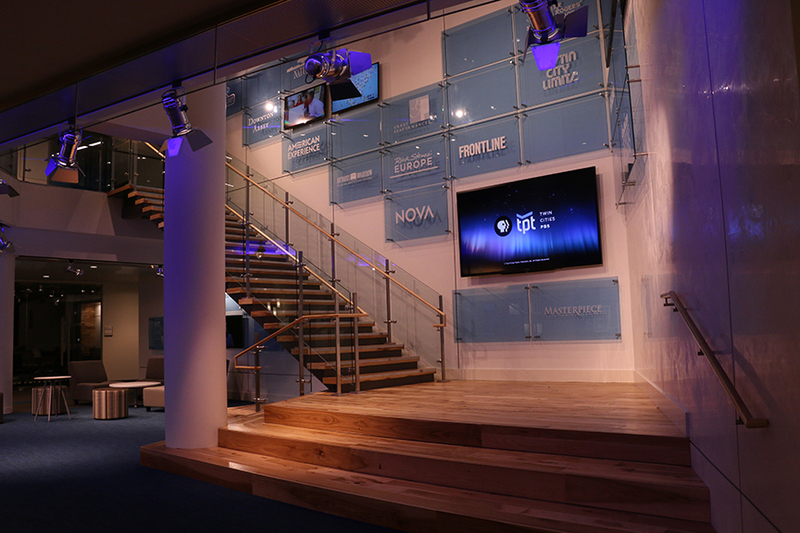 Two Sharp 90” LED displays and four Sharp 48” displays are installed to display digital content. Unlike most organizations who install digital signage in their lobby or offices, TPT has lots of digital content to show. Jacobs explained, “TPT has four channels, TPT MN, TPT 2, TPT Life and Weather. In addition, we have a very dynamic website. The install screens run the live feed from these channels, data from the website, or video from past TPT shows. It gives us the opportunity to show the great work that we do here.” One of the most important screens installed in the Studio Atrium is dedicated to recognizing TPT donors. Alpha Video designed a customized, easy-to-use GUI interface for the Crestron Control system to make it easy for TPT’s marketing department to select and schedule the content for every screen installed throughout the office. 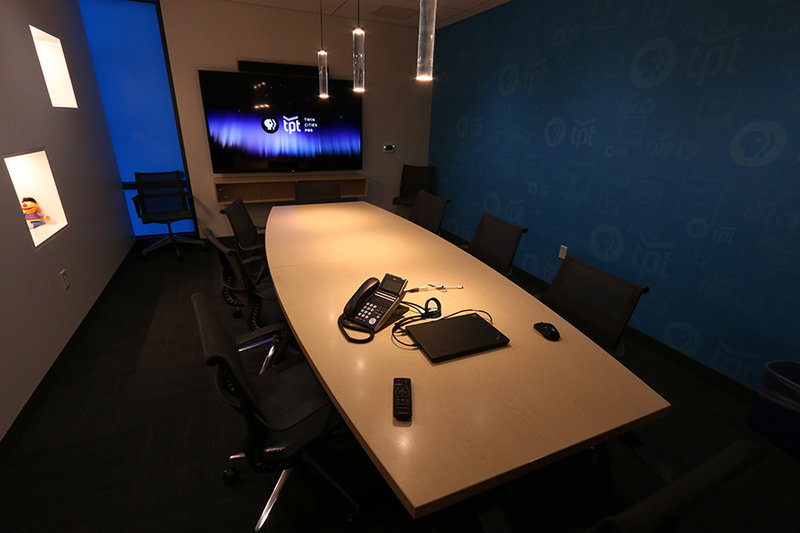 From an office space that made it difficult for employees to collaborate, TPT now has over 35 meeting spaces with presentation systems spread throughout the facility. These meeting spaces include a board room, several conference rooms, huddle rooms, and break-out spaces. Alpha Video designed two technology models for the meeting spaces. 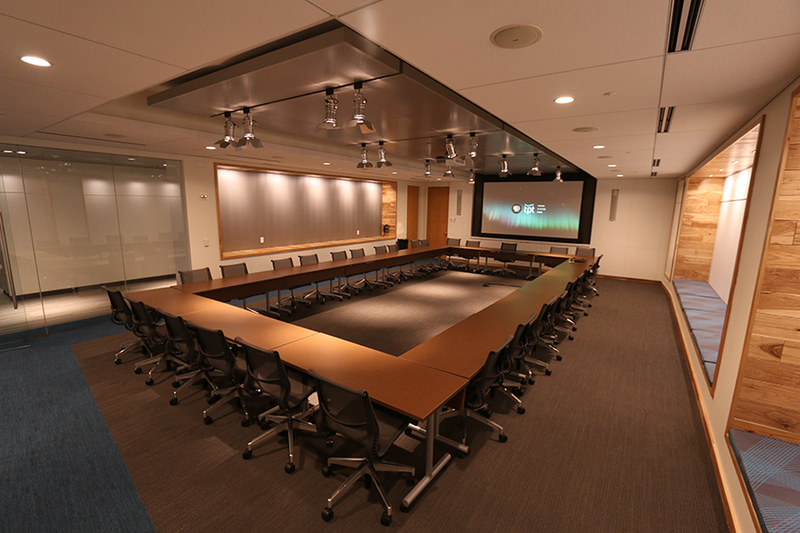 The boardrooms and conference rooms are fully equipped with a Crestron control system and can be reserved through Outlook. The huddle rooms and break-out spaces have one monitor and use a simple Flipper Remote that allows meeting attendees to only power on/off and adjust channel and volume. The showpiece of the meeting spaces is the boardroom. It includes a Sony 4000 lumens laser projector and a Da-Lite 133” electric screen for presentations and an Audio Technica audio system with 12 wireless boundary mics for conference calls and voice reinforcement. Apple TV with AirPlay is installed throughout the facility for wireless collaboration. AirParrot software is used for employees using non-Apple laptops and mobile devices. In six hallways located throughout the office space, four 32” displays are installed side-by-side. These displays are running the same type of content as the Studio Atrium. They provide a great way to recognize the outstanding work being done by TPT’s employees who are committed to creating outstanding, best-in-the nation, public TV programming.